NEW YORK TIMES BESTSELLER • A worthy heir to Isak Dinesen and Beryl Markham, Alexandra Fuller shares visceral memories of her childhood in Africa, and of her headstrong, unforgettable mother. Though it is a diary of an unruly life in an often inhospitable place, Don’t Let’s Go to the Dogs Tonight is suffused with Fuller’s endearing ability to find laughter, even when there is little to celebrate. Fuller’s debut is unsentimental and unflinching but always captivating. In wry and sometimes hilarious prose, she stares down disaster and looks back with rage and love at the life of an extraordinary family in an extraordinary time. 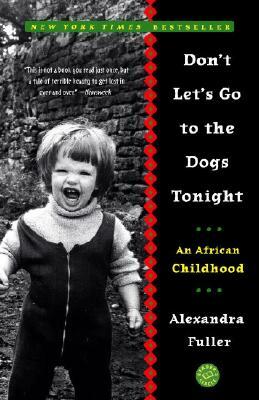 From 1972 to 1990, Alexandra Fuller—known to friends and family as Bobo—grew up on several farms in southern and central Africa. Her father joined up on the side of the white government in the Rhodesian civil war, and was often away fighting against the powerful black guerilla factions. Her mother, in turn, flung herself at their African life and its rugged farm work with the same passion and maniacal energy she brought to everything else. Though she loved her children, she was no hand-holder and had little tolerance for neediness. She nurtured her daughters in other ways: She taught them, by example, to be resilient and self-sufficient, to have strong wills and strong opinions, and to embrace life wholeheartedly, despite and because of difficult circumstances. And she instilled in Bobo, particularly, a love of reading and of storytelling that proved to be her salvation. Alexandra Fuller writes poignantly about a girl becoming a woman and a writer against a backdrop of unrest, not just in her country but in her home. But Don’t Let’s Go to the Dogs Tonight is more than a survivor’s story. It is the story of one woman’s unbreakable bond with a continent and the people who inhabit it, a portrait lovingly realized and deeply felt. Alexandra Fuller was born in England in 1969. In 1972 she moved with her family to a farm in Rhodesia. After that country’s civil war in 1981, the Fullers moved first to Malawi, then to Zambia. Fuller received a B.A. from Acadia University in Nova Scotia, Canada. In 1994, she moved to Wyoming, where she still lives. Fuller is the author of several memoirs, including Travel Light, Move Fast, Leaving Before the Rains Come, and Cocktail Hour Under the Tree of Forgetfulness.